Every so often on an exploratory trip hubby will declare ¨this is a nice road.¨ It´s taken a while but I´ve finally understood the difference between just any old road and a nice one. Having driven from home (Jaén) to Malaga airport, on to Granada city centre and then back to Jaén I was feeling just a little jaded and more than fed up with autovias (dual carriageways.) 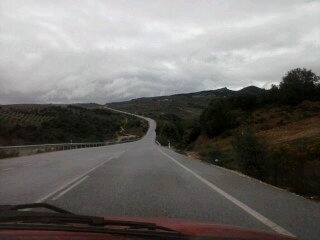 I headed off towards Alcala la Real, the day was miserable and grey, the roads empty and the views spread out all around me. Long sweeping bends with good vision, a foot hard-pressed and revelation crept in - this definitely hits the nice-road, easy-driving category. Want to see where exactly it is? Go to the list of Monday Morning Photos.